Grand Beach features lakefront accommodations with classic beach-style décor, including white trim, red roof tiles and palm tree-lined pathways. 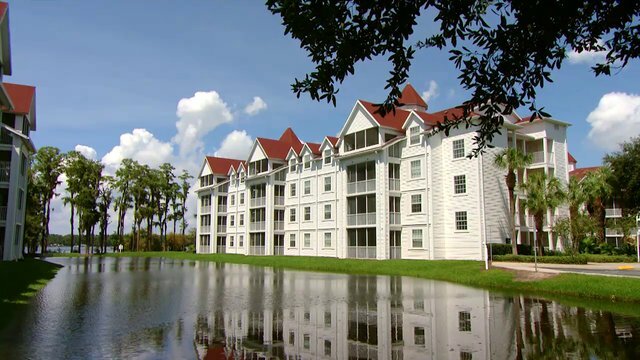 Located in the heart of Central Florida on Orlando’s Lake Bryan, Grand Beach is the perfect family-friendly destination with fully-equipped kitchens, oversized baths and spacious accommodations. Spend a day at the resort soaking up the Florida sunshine or relaxing in one of the outdoor pools. Discover comfort in our accommodations featuring a king size bed, sofa bed and full bathroom complete with complimentary amenity kit. Enjoy the convenience of the full kitchen equipped with a refrigerator, microwave and dishwasher among many other modern appliances. Additional in-room amenities include cable television, DVD player, telephone and balcony/terrace. Directions to Resort: From the Orlando International Airport (MCO), take the north exit (S.R.436) to exit #1 (528 West) and follow that to I-4 west. Follow I-4 west to exit #68, Lake Buena Vista exit. Make a left at exit #68, turning onto S.R. 535. Go south. Resort will be on the left side approximately 1 mile after exiting the interstate. Miles of pristine beaches, tiny island keys and underwater reefs surround the boundaries of this southeastern peninsula providing the quintessential holiday destination. Here, in this inland oasis, you will find high-energy adventure, endless amusement parks, entertainment and shopping extravaganzas. From the non-stop adventure of Orlando to the shores of the Atlantic Ocean and the hypnotic nightlife of Miami Beach, every generation will discover a multitude of cultural and historical venues mixed with exhilarating adventure. Parks & Attractions: Orlando's famous attractions are just minutes away, Walt Disney World, Universal Studios and Sea World. Housekeeping Service: Daily housekeeping service is available for a nominal fee. Call front desk reception to schedule. Details: Pools open from 8 am - 11 pm. All pool decks are non-smoking. - All Guest Suites along with the pool area are Non-Smoking. - A car is necessary to fully enjoy the area. - Hotel Guests and Exchange Reservation: A photo identification, credit card for $100 security deposit and a daily $14.95 plus tax resort fee will be required (cash is not an acceptable form of deposit). Resort Fee includes pools and hot tubs, poolside movies, fitness room, business center computer/Internet and boarding pass printing. * Please note that guests checking in on a Destination Xchange reservation are not assessed the resort fee. - Owner Weeks and Member Points Booking: Photo Identification and credit card for $1 security deposit will need to be provided at check-in. Resort fees will be waived when staying on your owner week or member point reservations. - A resort fee of $14.95 plus tax per night will be added to the reservation if the owner or member of THE Club® is checking in on a rental reservation. Highlights: All NEW Miniature Golf Course and Playground!